Welcome to the initial version of the EITBOK wiki. Like all wikis, it is a work in progress and may contain errors. We welcome feedback, edits, and real-world examples. Click here for instructions about how to send us feedback. This Guide to the Enterprise Information Technology Body of Knowledge (EITBOK) attempts to help the practitioner and aspiring practitioner see themselves as part of a community of those who work together within enterprises across the globe to facilitate the successful execution of the enterprise's activities. Enterprise IT (EIT), at its heart, provides the circulatory system for the information that drives the enterprise's decision-making and thus its ability to survive and thrive. By depicting the activities that an Enterprise IT professional engages in, we are able to see the skills needed to perform the various roles within an EIT organization. Although there are very many nation-specific and region-specific job classification schemes and skill certifications, this Guide recognizes that EIT is global, and that its skills are international. The development of this Guide has engaged the participation of individuals from several countries. Consequently, in this Guide, we refer to skills described in several EIT skills frameworks, including the Skills Framework for the Information Age (SFIA) used in many countries, the i Competency Dictionary (iCD) in Asia, and the European e-Competence Framework (eCF). We've selected role names reflecting names common to the ISO/IEC 20000 standard, ITIL V.3 (which now aligns with ISO/IEC 20000), and other commonly used IT service management (ITSM) frameworks. In addition, we present frameworks for assessing the maturity of EIT organizations. There are several hallmarks for the maturing of a profession. One of the most important is an agreement by the professional community on what knowledge is included in the profession, including how that knowledge should be captured and organized to facilitate use by practitioners, researchers, and educators; i.e., a guide to its body of knowledge. Without a recognized body of knowledge for practitioners, each practitioner has no community-accepted framework to structure their understanding of the field, and any organization that certifies practicing Enterprise IT professionals and guides career development does so without the benefit of community-accepted standards. And in everyday work, the lack of a standard, commonly accepted vocabulary to facilitate communication among its practitioners and with the larger enterprise they operate within impedes effectiveness and advancement. There is no authoritative source that defines and organizes knowledge across the whole of Enterprise IT, including its methods, processes, practices, and tools. The resulting knowledge gap creates unnecessary inconsistency and confusion in understanding roles in Enterprise IT projects and programs; and in defining common products and processes. This EITBOK will fill that gap, becoming the "go to" reference for IT practitioners and practitioners to be. The process of creating the EITBOK Guide will help to build community consensus on the boundaries and context of Enterprise IT thinking, and use this to help understand and improve the ability of business management science and engineering disciplines to work together. Having a common way to refer to Enterprise IT knowledge will facilitate communication among IT professionals and their business partners. It will also provide a shared baseline for consistent competency models, certification programs, educational programs, and other workforce development initiatives around the world. The EITBOK leverages respected existing guides to bodies of knowledge in specific areas of IT practice, such as business analysis and data management. This includes guides to the related disciplines of software engineering (SwE) and project management (PM), and three of the five ACM/IEEE Computing Curricula: those for Software Engineering, Information Systems, and, of course, Information Technology. It is important to point out that the EITBOK Guide is not in itself an inclusive compendium of all Enterprise IT knowledge. Rather, the EITBOK is a portal that guides the user in finding and understanding where to seek information in the vast amount of material that has been separately published in books, articles, websites, and other generally accessible resources. All references included in the EITBOK are generally available to any interested reader; i.e., no proprietary information is referenced. However, references that are available to any interested reader are not necessarily free; some references are to books or standards that must be purchased. The criterion for inclusion is simply that the authors believed them to be among the best generally available sources of information on the topic. To promote a consistent view of Enterprise IT work and its importance, worldwide, across national boundaries. To provide consistency with an internationally accepted skills framework (SFIA), as well as regional frameworks (from Japan and the European Union) as the basis for role definitions within Enterprise IT and therefore as a basis for competency evaluations. To provide a single, readily accessible portal to the widely scattered parts of the body of knowledge stretched across the globe. To provide information about existing international standards that can be useful for IT practitioners and organizations. To provide a common, unified foundation for discussing, analyzing, and maturing the EIT profession. Like other guides to professional bodies of knowledge, such as the SWEBOK, DAMA DMBOK, BABOK, and the SEBOK, this Guide can serve a variety of useful purposes. As a guide to the body of knowledge, the EITBOK Guide most directly enables the Inform Practice and Inform Research uses. These are the heart of what the enterprise is about. The EITBOK supports the remaining three uses, but less directly. For example, the use Inform Certification of Professionals is supported by the sections in each chapter that describe the skills needed to perform in that area. The EITBOK can play an important role in this area. As it stands today, there are thousands of different certifications offered by various vendors and various professional education companies. By working with the European Union, and several European ICT organizations, such as the Council of European Professional Informatics Societies (CEPIS), as well as the Information Technology Promotion Agency in Japan, we are encouraging the emergence of common names for skills and roles. The EITBOK addresses Enterprise IT functions, activities, and roles in medium to large EIT organizations. Although small EIT organizations may not define jobs (positions) in the same way as larger organizations, the functions performed by various roles are still usually necessary. In smaller organizations, many roles may be carried out by a single person. Thus, the activities described here can apply to any size organization. However, we recognize that not all EIT organizations have the same breadth of responsibilities, so some of the activities described here may not be carried out by all organizations. The EITBOK presupposes a flow of information and decision making from enterprise strategy formulation through various activities that cascade that strategy through the organization, via defined projects and translation of project results into operations. We have divided the EITBOK into two main parts: The Enterprise Perspective and The Life Cycle Perspective. The Enterprise Perspective presents subjects that define the enterprise's IT needs from the EIT organization (Enterprise Architecture, Strategy and Governance, Change Initiatives) and that form the backdrop for all EIT projects (Interoperability, Security, Quality, Disaster Preparedness, and Operations and Support). The Life Cycle Perspective represents the lifecycle of a system, from the development of its requirements, through construction and into operation, and then its retirement. The knowledge areas (KAs) in the EITBOK represent areas of practice rather than areas of learning. That is, in an EIT organization, we may find specialists in security practices, in disaster recovery planning, in developing requirements for EIT services, or in construction of those services. Each KA contains a diagram that provides a quick overview of the KA. 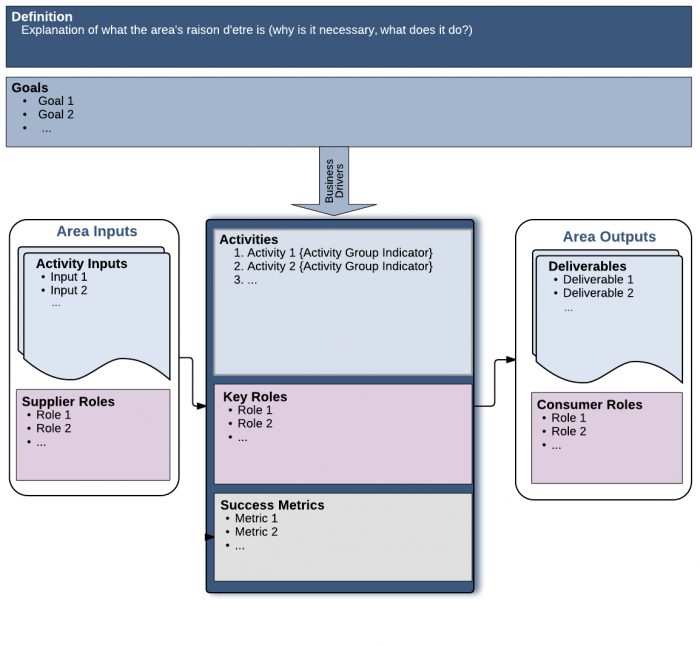 It shows activities requiring knowledge in the KA, information inputs to and outputs from the activities, and the roles involved in the activities. The figure above is an example of a context diagram for a KA. This page was last modified on 22 December 2017, at 23:36.